I have slept well. We all have the full breakfast. I decide that today is a shorts day. I have to retrieve my red fleece from the Albert hotel. (Written by Thierry) After breakfast Matt and I have to drop off the hire car. Due to some "shortcomings" in their booking system there was nobody available to give us a lift back to St Bees for about 20 minutes. Therefore we only set off at around 9:30. Started the walk for real after a quick dip in the freezing cold Irish sea. After a short walk along the coast we finally head East towards Cleator, where we stop for a drink at the Three Tuns. Weather is fine, but very hazy with low cloud level. 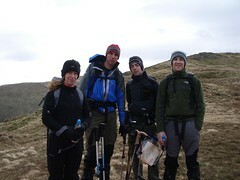 Next we took on Dent Fell, which for all over 18s was a bit of a struggle. Due to the haziness, all we got to see from the top was a fake SAS man. After a rather steep descent we eventually made it to our 2nd pub stop, the Shepherds Arms hotel in Ennerdale bridge. Spurred on by M&Ms and the prospect of a nice dinner we walked the last 5 miles along Ennerdale lake to the YH. Darren was a clear winner in the final sprint to the hostel, where dinner was waiting. Despite the pain and the mysterious rash on my leg, the nice birthday surprise cake was a great ending to the day. The hostel warden is heard to say "You told me that they were candles"
(Written by Darren) Up at 7:30, all are fairly rested despite Chris' snoring. Slowish start to the day, all feeling fighting fit, no real aches, which is good. We opted for the healthy, small breakfast of just cereal and toast. The bacon smelled fab but we didn't give in. Headed out along the valley, weather was a bit murky but looked reasonably promising. 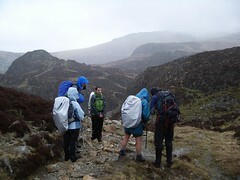 However as we started to climb up to Haystacks, it turned for the worst, eventually resulting in hail and full on rain. We all togged up but the wind picked up too, so we got pretty miserable. At the top the view over Buttermere was spectacular, but heavily surrounded by cloud and mist. Climbed to 600m, as high as we were going today. 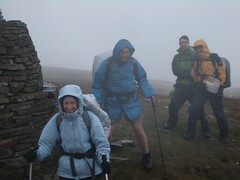 We were all getting quite cold due to the wind and rain, so didn't really stop anywhere. We reached Honister, where there is a café, so we headed for shelter, found a fab hot air vent, so all tried to dry off as much as possible. A nice walk down into Seatoller, where we stopped at a café which at least used to called the Yew Tree Inn. Had a couple and then headed on for the last 2km to Rosthwaite. A beautiful walk through the woods down by the river. We struggled to find Gillercombe guest house and realised that we'd walked about 100m to the north so had to walk about 1lm back along the road. The place is very homely and Rachael, the owner is very pleasant and chatty. Darren 2, Thomas 0. Has food at the Riverside bar in the Scarfell hotel, food OK but late. Thomas, notably was brave and didn't have gammon. As it was Annette's birthday Chris got some champagne in. Quality beers were had and a few glasses of whiskey. Chris whupped Thomas at beer mat flipping. Thomas's forfeit was to pay for dinner tomorrow for everyone. (Written by Thomas) Oh dear … well day started very well, Thierry offered me a slice of bacon to add to my "lacking" breakfast, no beans! After breakfast had a steady climb up to the first climb, met an irritating man. I got to the top first. From here my day went downhill, my boots started rubbing, Matt stopped to help when I finally gave in. The repair didn't help much, but braved on anyway, until … Number 1 of Annette's injuries came in, boots started rubbing in the same place as mine and didn't we know it. After being told to "shut up" I continued to help, the fix didn't work. Stopped for dinner, was lovely. I left the camera somewhere in one of two places, 1 or 2 miles away. 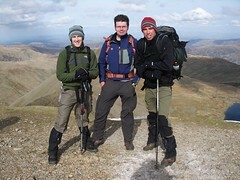 Darren, Thierry and Matt continued to the 3 summits, whilst me and Prof went back to look for the camera. I ran back to the first place and stopped to fix my foot, Oh Well. We returned to find mum cold. The descent was great fun, twisted my already sprained ankle again before we began, horrific descent. Annette was REALLY fast down and very jovial. Annette developed "lots of injuries" over the past two hours, ranging from stubbed toe to cutting herself with a knife. Over to the White Lion for dinner. Matt leaves us, top bloke. See "Dad and two lads" for the first time in the pub. Walk up to the village shop to buy lunch, leave at about 9:30. Lots of singing on the way up. Past Angle tarn, still climbing. Thierry and Thomas sing all the way up. On to High Street, first time for me, very windy. Go past Hayes water without realising it. Along to Kidsty Pike and then a painfully descent to Haweswater. Lunch as soon as we meet the water. Nice lunch, a Hawk comes over, Spey engine at approx 80% NH, TGT 750. We walk along a never ending lake which then leads to a never ending footpath. Miserable rain starts by the time that we get to the Abbey. Long drag up to Shap. Friendly bunk house, sit by the fire. Go to the Bulls Head for tea. We have Eye of the Tiger on the jute box three times on the trot. Teach Thierry how to play dominoes. Meet the Astronauts for the first time. The day ends with a dram by the fire when we get in. Bells ring at 7:15am, out of bed for 7:29½. I have problems getting off the top bunk, due to weak legs. Call at the Co-Op for food. Start walking at 9:10, quickly cross the West coast main line and then over the M6. Wave to a few drivers. Receive a text from Chris Ash about the FTB. Green fields and then we get rain and hail. Stop for 11s. Lunch at Sunbiggin. I sit on a milk crate. The whole family come out and bring their milk bottles, I have to stand up. 4pm coffee by Smalldale bridge, I get a wet bottom. Arrive in Kirby Stephen for 5:30pm, tired feet. Thomas touches the YH first to make the score 4-1. Showers and then down walk down to the Black Bull hotel. On the walk down Annette and I are amazed to see two Parakeets fly in formation down the main street. After a couple we go and buy some food. Thierry feels the need to satisfy his pasta fetish. We have chicken curry. Just before we go to bed some bloke shatters my illusion that tomorrow will be an easy day by telling us that it is 13 miles, all uphill. Bed for 11pm, sleep well. (Written by Thierry) All up at 8am, apart from Darren who got up at early to go to see the Doctor about his soar throat, and Thomas who stayed in bed for another thirty minutes, hardly Marine like. While me and Annette fetched breakfast ( paid exactly £8 at the Co-Op ) Darren got told not to do any strenuous exercise for a couple of days. Set off at 10:30 with waterproofs on, it was already raining and windy. After crossing Franks bridge we started the ascent to Nine Standards, the highest point of today's walk. At the top it was very misty and very, very, very windy. After taking a bit of shelter behind one of the nine standards we set off across the very muddy moors in gale force winds and slight rain. After a short period my shoes were soaked, despite my best efforts to jump between puddles and raging rivers. Following the descent into the river in the valley and a short lunch, we got chased after, some would say attached, by a viscous ram. After this near death encounter we continued our path over wet and muddy land, through the beautiful dales to Keld. Thomas, failing to read the rules of the game, came in second again, after his fluke the previous day. Darren 4, Thierry 2, Thomas 1. Keld was a well deserved threat for reaching half way. After a nice dinner with a Royal Engineer called Steve, we settled for a quiet drink in the bar. Chris and Annette stayed in room 7, the same room that Julia Bradbury stayed in when filming the Coast to Coast. Tony filled us in on their filming, they took 1 year to film the 12 days and even filmed Nine standards in a white out blizzard. (Written by Darren) After a restful nights sleep in the comfy bed, our convivial host, Tony presented us with a rather hearty full English to start our day. We waved goodbye to Steve and wished him well on his 26 mile day, a bit tougher than our 12.5 mile day. Headed out at 9:15, after some banter about the number of different words that we have for rain, that was starting outside. A peasant stroll through Keld village down to the river Swale, which we followed its meandering path for the next few hours. A very beautiful dale, would be nicer without the drizzle. We bumped into the Astronauts at Ivelet bridge. We continued along the banks of the Swale, shirting its beer coloured waters, stained by the peaty hills. At noon we stop at Gunnerside, at the Kings Head for lunch and refreshments. At the wall out side was a plaque for the InnWay of which the King Head is number 13 out of 26. To be done in 6 days, totally 76 miles. We headed up the hill out of Gunnerside, after about 5 minutes I realised that I had left my poles outside the pub. So had to run down the big hill to get them, pretty knached when I got back to the others. We set off again down to the river and Thierry and I seemed to lose the others. We strolled along and then the footpath turned into a wall. The sheep below as looked quiet perplexed to find two mountaineers walked above her head. 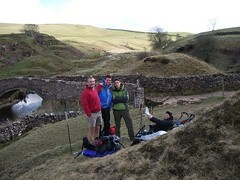 Thomas caught up with us as Annette had stomach ache, so they headed up to Low Row for some conveniences. As we pressed on the weather had really cleared up, so was down to only base layer on top, only second time of the trip. We decided not to head into Reeth but to cut the corner off and head straight to Grinton. The three of us stopped at the Bridge Inn for a pint to wait for Chris and Annette. No sign of them so we headed to the YHA, which was unfortunately half a mile up a very steep hill. Thomas having the benefit of youth legged it to the YHA first … Unfortunately for him, Chris and Annette had arrived first, so he looses again, hah, hah, hee, hee. Youth hostel is a fantastic Victorian hunting lodge, perched on the side of the hill, overlooking the dale. Sat having a beer in a huge bay window. Had dinner at the hostel three courses for £10, good food, bargain, even had sticky toffee pudding. We then all congregated to watch Coast to Coast on BBC4, unfortunately no digi-box, so we could not watch it. Instead, Chris and I watched Coast, which as he says, was half as good. (Written by Thomas) 8am wake up, Darren goes for ritual early morning shower, door slammed on his way into the room. Me and Thierry start to come around as he stampeded around the room. Thierry does not want breakfast so decides to stay in the room. The rest of us head out of the room and down to breakfast. All YOU CAN EAT BACON. ( Only had three slices ) Anyway !!! Me, Darren and Annette pocket a pain au chocolate for later. Took a shortcut down the side of the YH, first dead animal within ten seconds of departure. Continue down the unbelievably painful road. Three miles later we reached another of Darren's navigational errors. Two dogs attach me and Darren, Darren uses his animal charm and the dogs whimper away. Catch up with Dad and two lads, they are very tired. Explore Richmond and eat lunch at 2pm, at the Ralph Fitz Randle. I have Gregs. Pay to enter the castle and explore the extensive grounds, which were very very big … not ! Consider paying £940 for lifetime membership - Not ! Head back to the BnB for an hours relaxation. Prof ticks off three pubs and drinks in one, they count ! Head out for curry, very nice meal, prawn? Anyway head back to BnB for nice sleep. Breakfast at 8am, some of us have salmon and scrambled eggs, very nice. BnB very good and hospitable, second to none. We say goodbye to Richmond and up the hill. After filling Thomas's bag with extra things to help him up the hill. Very nice day with a promise of blue skies. We walk on through lots of farms. Photo on bridge, Army van offers to stop, we wave him on. Cross over the A1, to stop, at the point were we leave the Swale, trail mix and coffee. The road ahead was a long way, 24 miles, and we were looking forward to our first lunch stop. Sadly the White Swan at Danby Wiske was closed and for sale. This point was truly the lowest point of the walk. Oh well, a nice lunch on the triangle, left at 2pm, feeling refreshed, two more hard hours till 4pm stop. Thierry did not want to stop because of a dead rabbit, so we walk a little further. Thierry informs Darren than "Standards must not be allowed to slip", when he tries so stop at 1:57:25. 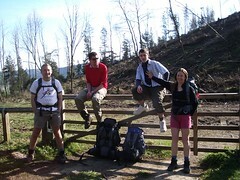 Just before we met some nice people that told us the YH was up the long distant hill. At 4pm, we decide it is only 3km to Ingleby Cross, so decide to push on. There for 5pm, Blue Bell for one, meet Astronauts again. Push on up the hill to Osmotherly, try the Golden Lion, and then the Queen Catherine for food. Arrive in the dark at the Youth Hostel. Evening at Osmotherly YH, turned up a little late, Hitler in charge, wants all our cards. Quick wash and change and back in the bar. Thierry, Thomas have cake and tea. Darren, Annette, Prof have beer and whiskey. 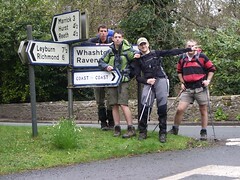 Up at 7:30, good breakfast, meet a team of cyclist who are doing the Coast to Coast in 2½ days. Big T, or the Luxanator as he is now known, is a bit of a hit with the ladies outside, who were telling good jokes. What bees produce milk ? Boobees. Four members walk in shorts all day, blue skies. Start walking at 9:10, at first cairn we have coffee, great views to the North coast, we can see Teesside, Middlesbrough and Redcar. We can see the sea, and also the pollution layer. A strange cloud formation comes over, we see a report about it later on national news. Its seems not far to go so we have a long 11s. 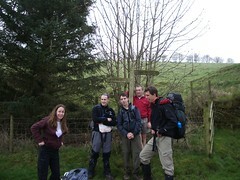 Lunch after Carlton Bank, have Cadbury cream egg from Darren, have a nice long rest. We meet two girls and one bloke from the pub last night. Towards the end of the afternoon we have a dilemma, whether to cut the corner to Great Broughton or walk over two more hills to Clay Bank top. We stand to our principles and go over the tops. Walk down to Great Broughton, stay at Ingle Hill. 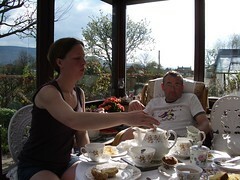 Have tea in the sun lounge with fantastic views of the hills and fantastic cakes. Showers and sleep and then walk into town at 6pm. One in Wainstones and then dinner at the Bay Horse was very nice, feeling very full. We made our way back to the BnB where we were invited to the lounge by Margaret, to watch a little TV and have a chat. (Written by Thierry) Got up for breakfast at 8am, all of us stuck to the no full breakfast, except Chris, who at the last minute succumbs to bacon, sausage and eggs, no tomatoes and mushrooms as usual. After breakfast we had a lift back to Clay Bank top by Margaret's daughter. 9:15 start, start the walk behind, Dad and two Lads, and followed by two girls and old guy. After a steep climb up the moors we continue across the moors on a disused railway track. After the usual 11am break we soon made it to the Lion Inn at noon, where we had drinks and nibbles. A couple with a fab Labrador turned up, each time that food was brought out of the pub, the dog barked like mad. Expecting that its was his food, he even knew the difference between trays of beer and food. Following the gorgeous sunny morning the weather starts to turn cloudy and colder. The path remained relatively easy with no major ups or downs, but seemed to drag on forever. 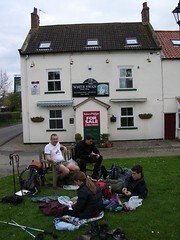 We arrived at the Arncliffe Arms pub at 4:15pm, I claimed another sprint finish. To ensure a decision on the last day, Chris has decreed that a full immersion finish will gain 5 points. Upon arrival we had a quick drink in the bar, which was too much of a challenge for Chris, who just let go of his drink, causing the bar maid to exclaim, "What did you do that for ?" Whilst discussing tomorrows walk, and how late we can get to the youth hostel, Chris said they can just leave the coffin outside. After showers and a quick power nap, we reconvened in the pub for a very nice meal, discussing tactics for the final day ahead. (Written by Darren) A superb breakfast of gypsy toast (C), kippers (A+D), F.E.B (T+T) was had to start the day. A very similar day that started the trip at St Bees, greeted us today to complete our journey, very cloudy, grey and misty. We booted up outside and saw the old man and two boys heading down the lane. Chris was too slow, so they promptly passed us. We headed down to the bottom of the hill to beggars bridge to take pictures, the old man and his boys had a navigational problem so we swiftly overtook them. A very nice climb through the woods followed and a descent into Egton Bridge. Grosmont followed where Thomas and I saw a stream train seemingly ready to pull out so we raced like children to take a look. Fortunately it did not depart for ten minutes so the others caught up and got to see it too. We all waited for it to depart and took photos, it was quite a spectacle as the station was still stuck in the 1950's era. The village had an old world Co-Op too. A very steep climb out of the village followed, up a hill that had the same %age incline that Chris had remaining life-force (33%). We crossed the moor land at the top of the hill, seemed quite desolate, well it would of if it was not for the road, which was the moor land equivalent of the A52. Eventually we descended to the very charming hamlet of Little Beck. A brief minor disagreement ensued between Thierry and I, I thought the most efficient route was best, but Thierry wanted not to deviate from the route by more than 2mm, In the end the others wanted to go that way so that way we went. However it was a very pleasant walk. We saw the Astronauts in Little Beck and again halfway thru the walk at Falling Foss. We then crossed the moors again and it got boggier and boggier. We all ended up pretty wet, Annette couldn't do it, Thomas got pretty shitted up. The old man and his boys followed us, we tried to give them some advice to avoid the bog, but I don't think they believed us. We didn't wait to see their misfortune and pressed on. A pint followed in the Hare and Hounds in Hawsker, which had a very strikingly tall and slim and quite pretty bar maid. We spotted a poster for the Onion club, a very peculiar club that grows onions and culminates in a who has the biggest completion! Very funny. After Hawsker the coastal path beckoned, as we headed up the road, we could tantalisingly tear the seagulls, but the sea was out of sight. After a few minutes and an additional plaster for Annette, we saw our first glimpse of the sea. It would be one of the few sights of the sea we would see until Robin Hoods bay as the thick mist clung opaquely to the cliff edge. 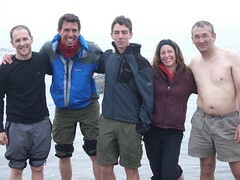 We reach Robin Hoods bay after about 25 mins and was greeted by friends of the Astronauts, who kindly cheered us in. Worryingly the Astronauts, ( or Sue and John as now found out ) were no where to be seen, despite our 45 minute rest in the pub. We finally reached the sea, the end of our epic journey to dip our feet in the sea. A nice lady walking her dog took our photo, and Chris decided to win the "First past the post completion" by going for full immersion. He turned into quite a spectacle. After drying off we headed to the Dolphin for celebratory beers. (Written by Me) I have a lovely big steak for tea. The Astronauts fortunately turn up later at the Dolphin. Have quite a few Old Peculiars. At the end of the evening the boys decide to walk back in the dark, Annette and I get a taxi. Eventually arrive at Boggle Hole YH, have a couple more in the bar.